It’s official: Solar, wind and biomass energy now have competition from geothermal energy. We wrote about the advantages of this type of alternative energy not too long ago. And if that made you wonder why the geothermal sector wasn’t as popular as the solar and wind sectors, you were not the only one – Washington last week recognized the sector’s promise. The geothermal energy sector received a huge boost last week, as President Obama announced he had assigned $350 million in stimulus funding to the Department of Energy’s Geothermal Technologies Program. We have a choice. We can remain the world’s leading importer of oil, or we can become the world’s leading exporter of clean energy,” the President said. The move firmly establishes the geothermal sector as an alternative energy class on par with solar energy, which, incidentally, received $117.6 million in the same go, and wind and biomass energy. Geothermal energy has been around for as long as wind and solar energy but thus far has simply failed to endear the masses. At the moment, around 3,000 megawatts of Geothermal energy is generated in the U.S. Some 6 million households run on geothermal heat pumps. The sector has never been met the enthusiasm Washington displayed recently. The funding that President Obama made available represents more than all the government financing over the last two decades. “In one shot, this is more funding now than in the past 20 years,” Karl Gawell, executive director of the Geothermal Energy Association in Washington, D.C., told our colleagues at Greenbiz. 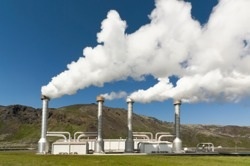 The promise of geothermal energy has already been mapped out in surprising detail by three major institutions. Engineers at the Massachusetts Institute for Technology (MIT) calculated that 100 gigawatts of energy could be generated nationwide in the U.S. The Geothermal Energy Association in Washington DC published a study recently in which it revealed that 126 geothermal energy projects are currently under construction that will add around 5,500 megawatts to the overall geothermal portfolio. The projects are mostly concentrated in the Western parts of the U.S. The US Geological Survey (USGS) estimated last year that as things stand now, there’s an estimated 9,057 Megawatts-electric (MWe) of power generation potential from identified conventional geothermal systems. The potential from conventional, undiscovered geothermal resources was calculated to be 30,033 MWe. Enhanced Geothermal Systems (EGS) are estimated at a potential of 517,800 MWe. The results of this assessment indicate that full development of the conventional, identified systems alone could expand geothermal power production by approximately 6,500 MWe, or about 260% of the currently installed geothermal total of more than 2500 MWe. […] The power generation potential from identified geothermal systems range from 3,675 MWe (95% probability) to 16,457 MWe (5% probability); the power generation potential from undiscovered geothermal systems range from 7,917 MWe (95% probability) to 73,286 MWe (5% probability); and the power generation potential from Enhanced Geothermal Systems range from 345,100 MWe (95% probability) to 727,900 MWe (5% probability). That’s a tad more optimistic than the MIT study. Now that the potential of this new alternative energy resource has been plotted, there’s no question that it will be tapped in the foreseeable future. As for the different kinds of geothermal energy available and the potential for individual households to install geothermal pumps, check out our recent coverage. The $350 million funding is dispersed by the DOE’s Geothermal Technologies Program under the auspices of the American Recovery and Reinvestment Act. Almost half of the funds, $140 million, will go to demonstration projects in new regions, oil and natural gas fields, geopressured fields and areas with lower-temperature resources. Another chunk of cash, $100 million, will finance exploration activities including siting, drilling and techniques known for their high upfront risk. This is money well spent because the vast majority, 80%, of all US geothermal sources are very hard to get to and need sophisticated drilling and siting techniques. The rest of the funding, around $110 million, is allocated to Enhanced Geothermal Systems (EGS) and a data system. This research should lead to expansion of generation capacity. The DOE will also set up a nationwide geothermal data and classification system to assist with resource assessment. This system builds on the 2008 assessment of the USGS quoted above.